Swiss Institute and ARTBOOK invite you to join us for the launch of Imponderable: The Archives of Tony Oursler, Since the late 1990s, artist Tony Oursler has amassed a vast personal archive of objects and ephemera relating to magic, the paranormal, film, television, phantasmagoria, pseudoscience and technology. For Oursler, the archive functions as an open visual resource, historical inquiry and–most intriguingly–a family history. This publication features up to 1,500 objects from Oursler’s collection, including photographs, prints, historic manuscripts, rare books, letters and objects. Additional topics include stage magic, thought photography, demonology, cryptozoology, optics, mesmerism, automatic writing, hypnotism, fairies, cults, the occult, color theory and UFOs. This catalogue is produced in conjunction with the exhibition “Imponderable: The Archives of Tony Ourslers,” on view at Les Forges, Parc des Ateliers, Arles, France, July 6-September 20, 2015 and LUMA Westbau, Zurich, October 31-February 14, 2016. Commissioned and produced by the LUMA Foundation for the Parc des Ateliers in Arles, France. Curated by Tom Eccles and Beatrix Ruf. Edited with text by Tom Eccles, Maja Hoffmann, Beatrix Ruf. Essays by Jordan Bear, Karen Beckman, Branden Joseph, Fred Nadis, Stephanie O’Rourke, Jim Shaw, Chris Turner. A signed limited edition print by Tony Oursler, numbered to 66, will be included with the purchase of each book at the Swiss Institute launch and signing. Noam M. Elcott is Assistant Professor of Art History and Archaeology at Columbia University and an editor of the journal Grey Room. He specializes in the history and theory of modern art and media, with an emphasis on interwar art, photography, and film. He also teaches and writes on contemporary art. Artificial Darkness: A History of Modern Art and Media, his first book, is forthcoming from University of Chicago Press. Tony Oursler (b. 1957, New York) lives and works in New York City. He completed a BA in Fine Arts at the California Institute for the Arts, Valencia, California in 1979. His art covers a range of mediums working with video, sculpture, installation, performance and painting. Oursler’s work has been exhibited at Walker Art Center, Minneapolis; Documenta VIII, IX, Kassel; Museum of Modern Art, New York; Whitney Museum of American Art, New York; Centre Georges Pompidou, Paris; Carnegie Museum of Art, Pittsburgh; Skulptur Projekte, Munster; Museum Ludwig, Cologne; Hirshhorn Museum, Washington; and Tate, Liverpool. Stephanie O’Rourke is a PhD candidate at Columbia University, where she specializes in late eighteenth- to early twentieth-century visual culture. Her other publications include “Beholder, Beheaded: Theatrics of the Guillotine and the Spectacle of Rupture” in Visual Culture and the Revolutionary and Napoleonic Wars (Ashgate Press, 2015) and “A Surrealist Fact” in Object: Photo. Modern Photographs. The Thomas Walther Collection 1909 -1949. An Online Project of The Museum of Modern Art (MoMA, 2014). Photo: “Snake Cultists Who Regularly Defy Death…One branch of the Church of God has used poisonous snakes…in religious faith demonstrations… [According to Rev. 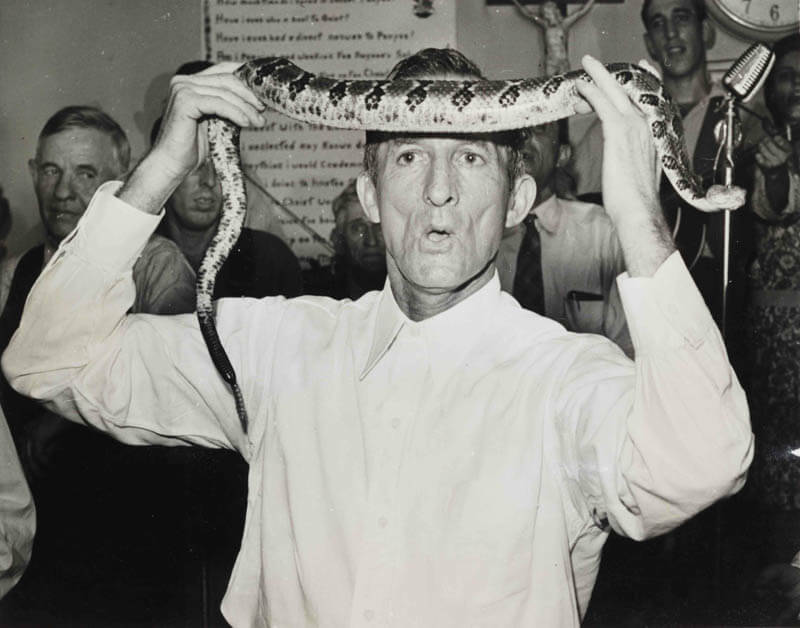 Oscar Hutton] the snakes are symbols by which the faithful are willing to risk their lives ‘to prove the power of God.’ He believes that once ‘power’ is felt, the snakes are harmless.” News photograph, Kentucky, 1947. Image courtesy of Tony Oursler’s personal archive.